These stories not only portray, with incomparable perception, humor, and compassion, women from the various strata of Iranian society, but they also capture the essence of a rich traditional culture undergoing change. A nanny lets go of a little girl’s hand in Shiraz’s exotic and crowded Vakil Bazaar, and goes off to flirt with the nutseller–the child is lost. In The Accident, the author portrays, in hilarious parody, a young woman who forsakes husband, children, and home just to own a car. The Playhouse is a traditional Persian theater where the play and the players act on many levels both real and fantastic. The Traitor’s Intrigue lets you into the life of a middle-class couple and brilliantly shows how a colonel’s allegiance passed from Shah to Khomeini. To Whom Can I Say Hello? tells of an old woman’s memories, her life, love, tragic outcome, and eventual hope. Loss of Jalal is a moving chronicle of the final days of Jalal Al-e Ahmad, one of Iran’s great writers and the author’s husband. Simin Daneshvar draws from over a thousand years of Persian storytelling tradition and combines this with modern techniques of short fiction and cinema. The result is both entertaining and a key of uncompromising honesty, rich detail, and a dazzling range of voices that guides the reader into the center of a complex society and its concerns. In five intriguing stories, the formal detachment of Daneshvar’s prose reinforces her subtle revelation of repressive features in Iranian society. The author, one of the few wellknown women writers in Iran, is a feminist opposed to both political tyranny and religious fanaticism, themes obliquely indicated here. These seemingly simple stories disclose a rich culture in a time of ferment and change, of women in chadors, held in contempt by the men who control their lives. “Vakil Bazaar” seems innocent enough, an everyday tale of an upperclass child let loose in the bazaar while her nanny flirts with a shopkeeper. By the end, with the little girl lost and the nanny passively peering around, the reader is sure that the child will never be found, and nobody will care. In “To Whom Can I Say Hello?,” a woman alternates between mourning the loss of her lover and her job and worrying over her daughter, whose brutish husband has denied his motherinlaw access to his house. The moving “Loss of Jalal” is a nonfiction account of the death of the author’s husband, a noted writer. This volume is a valuable addition to our knowledge of Persian culture and the political complexities of modern Iran. Beautiful flowing language gives these six stories a dreamlike quality. In the author’s letter, included in this edition, she says she is satisfied with the translation. Simin Daneshvar is fluent in English but writes in Persian. The language in each story differs depending on which character is telling the story. In “Vakil Bazaar” the sentences are descriptive, full of color and sound from the lost child’s point of view and filled with sensuality from the flirty maid’s point of view. In “The Loss of Jalal” the beautiful, insightful language is from the wife’s point of view (the author describes her husband’s death). In the story of a lonely old woman’s memories the language is narrative, descriptive, and flowing. Each story depicts an aspect of life in modern Iran and changes are shown through symbols and narrative techniques. In “Traitor’s Intrigue” the allegiance of a colonel changes from Shah to Khomeini. “The Playhouse” is a traditional Persian theatre where the actors act on many levels, real and unreal. In “Vakil Bazaar” the wanderings of the little girl through the bazaar is really a journey through life. Parody and humor are found in “The Accident,” a story about a young woman who forsakes husband and children just to own a car. This is an unusual book that reflects ideas from a rich culture written by the first published woman author of short stories in Iran. It is a wonderful book to read. Daneshvar (b. 1921) has a number of “firsts” to her credit. In 1948, her collection of Persian short stories was the first by an Iranian woman to be published. The first novel by an Iranian woman was her Savushun (“Mourners of Slyavash,” 1969), which has become Iran’s bestselling novel ever. The present work, a collection of five stories and two autobiographical pieces, is the first volume of translated stories by an Iranian woman author. It offers what translator Maryam Mafi emphasizes as a feminine perspective in stories dealing with a little girl whose careless nanny lets her get lost in a bazaar, a middleclass woman who ruins her family’s life in her passion for an automobile and driving; a retired army colonel who eventually sides with religious opposition to the Iranian monarchy; a smalltime actor hopelessly in love with a worthless young woman; and an old female servant who has nowhere to go because her soninlaw hates her. Not tightly structured nor stylishly told in the English translation, these stories give glimpses of Iranian life and of the author’s female perspective, and therein lies their value. Daneshvar’s autobiographical reflections on the death of her husband Jalal Ale Ahmad and on her life as a woman writer are particularly revealing. Appropriate for upperdivision undergraduates and general readers. Simin Daneshvar has long been recognized as one of Iran’s most talented women writers. She launched her literary career in 1948 at the age of twentyseven. In 1969 she published the bestselling novel Savushun. Now in her seventies, she has just completed another novel, “The Wandering Island.” Savushun will be out in English by the time this review appears in the late autumn of 1990, but in the meantime the curious reader can sample Daneshvar’s Playhouse, a collection of short stories written over the years. The six stories Maryam Mafi has carefully chosen and translated attest to the author’s preoccupation with realistic depictions of life in Iran. Mafi’s renditions make the stories accessible even to readers unfamiliar with the social and cultural setting of Daneshvar’s texts. Without losing too much of the flavor of the original, Mafi has, when possible, found idiomatic equivalents for Persian for terms and customs. Only in one instance-the erroneous equation of the legendary bird Seemorgh and the phoenix-does her practice become inconsistent. The metaphor of the playhouse unites the first five stories of the collection. Their protagonists, as in “The Playhouse,” are at the mercy of the social roles allotted to them. In the title story an actor dons a mask every night and plays out a role that reveals nothing of his inner needs and sufferings. His very name and identity have gradually become interchangeable with the type he represents onstage. The nanny of “Vakil Bazaar,” the middleclass housewife of “The Accident,” the retired colonel of “Traitor’s Intrigue,” and the lonely woman of “To Whom Can I Say Hello?” are all imprisoned in metaphorical playhouses of their own. Their lives are determined by conditions and norms over which they seem to have little control. Still,: Daneshvar endows her characters with the ability to break out of the mold. In “Traitor’s Intrigue,” for example, the colonel rejects a life of subordination and acts according to the dictates of his own conscience. The freedom he gains is, nevertheless, conditional and precarious. The last piece in the collection, although autobiographical, also conforms with Daneshvar’s understanding of literature as a fusion of the real and the fictional, the private and the public. “The Loss of Jalal” is Daneshvar’s personal account of the sudden death of her husband, the writer Jalal Ale Ahmad, in 1969. Her private grief becomes a very public mourning for a man who was an outspoken social critic and writer. The volume ends with a letter from Daneshvar to her readers. At times the letter reads like a political manifesto, spelling out the frustrations she has had to face as a writer a university professor, and a woman living in a patriarchal society. Her social criticism is equally directed at the West, whose decadence she observes with horror. Nevertheless, she ends the letter on an optimistic note: “I have great hope that my dreams will come true, if not for my generation, then for the next.” With the publication of Daneshvar’s Playhouse, her message of hope might find a larger audience. There has been a growing interest in the discussion and translation of Simin Daneshvar’s works in the last few years. Maryam Mafi’s translation of six short stories and a monograph is a welcome addition. It is noteworthy that in this selection the English reader is introduced to the works of a Persian woman who has enjoyed recognition unknown to most male Persian writers. Aside from the historically and socially significant place of such an author in the gamut of Persian contemporary literature, this translation once again exposes those crucial and controversial issues that will remain at the heart of the practice of translation, namely, loyalty to the source text as well as commitment to the intelligibility of the translation. Mafi’s work, for the most part, is a faithful one. It swerves from authenticity and loyalty in those instances where an English translator has to make a crucial decision between Anglicizing a culturally Persian element or Persianizing the English language in order to open room for the reception of a foreign phenomenon. Mafi often is capable of doing both, but there are instances where she makes a simplistic choice. By doing so, she diminishes the native environment and flavor of Persian culture for that of a clumsy and short-sighted rendition into English. The examples of such carelessness are numerous. I will only cite a few cases in the hope that these examples will point out the deficiency of this translation. When Mafi confuses simorgh, the mythical Persian bird, with the phoenix (p. 68), she chooses to bring the Persian element into English, but fails to explain or clarify its significance. It is true that both the simorgh and the phoenix are mythic birds, but they share little else. Sigha has been translated as “temporary wife” (pp. 17, 103); marriage through sigha, however, is of particular significance, and such a translation does not impart all its religious and cultural implications. The same is true with the translation of a “dervish’s kashkul” as a “basket” (p. 18). Though a dervish’s kashkul may be used as a basket, it is not in fact one. The kashkul has a particularly cultural and ethnic aspect that cannot be understood without directly bringing it into the target language. In “The Traitors’ Intrigue,” Mafi translates khoms and zakat simply as “Islamic taxes,” while they are, more specifically, the Islamic version of alms and tithes. When such precise vocabulary exists in English, a more faithful translation is possible without footnotes. In these instances, it would have been advisable to use the Persian noun and explain its fuller significance to the work. The translator has done this in other places, for example, when she uses the Persian “Khanum” in the English text, explaining its meaning in a footnote (p. 310). There are other errors of a simpler nature which mainly point to a misunderstanding of the literal meaning of the Persian text or a mistake in finding parallel words in English. The error in the title of “The Traitors’ Intrigue” (“Traitor’s” instead of “Traitors”‘) could be typographical, but considering the fact that the translated text is nicely free of such errors, one could assume that it is a mistranslation of kha’enin (plural of kha’en). Nakhlestanha-ye Bahmani is translated as “Bahman orchards” (p. 34), whereas “Bahmani palm groves” would have been more accurate and appropriate. Tigh-e khod-tarash is a razor blade, not an “electric shaver” (ibid. ), while mafatih means keys and not “clues” (p. 36). Questions of translation aside, the reader expects Mafi to explain the basis of her selection of stories in the Afterword, but she does not provide one. She speaks of the different works written by Daneshvar, but leaves unmentioned why she has selected these six stories and the monograph. The only common bond apparent among the six stories, with the exception of “The Playhouse,” is that all contain central women characters. Is this the primary criterion for the selection of these particular stories? One is left to speculate. Instead, the Afterword gives a biographical account of the Persian author’s life and works, and in broad terms mentions the thematic concerns of Daneshvar’s stories in which are included “the lifestyles of the lower classes, the traditional middle class, and the bourgeoisie,” “the social factors contributing to the unfortunate situation of women,” and “folklore and traditional Persian customs.” The collection also includes a monograph and a letter by the author addressed to the reader, as well as four photographs-three of which are pictures of ancient Iranian figurines and one of the author with her late husband, Jalal Al Ahmad. It is not clear what the relationship is between the pictures of the female figurines and the stories selected for this book, other than the fact that both the writer and the translator are female and, as mentioned before, gender seems to be an issue here. 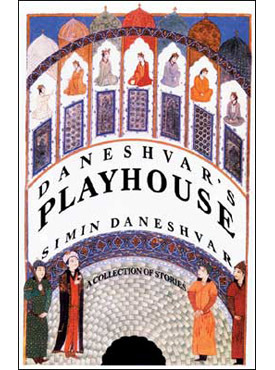 Daneshvar’s Playhouse is elegantly published, its prose style captures most of the flavor of the original text, and is above all a notable introduction to the works of Daneshvar in English. It carries with it the sanctification of the author.